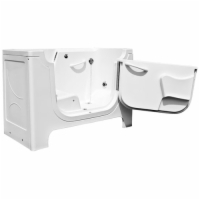 The Sanctuary Wheelchair Access walk in bathtub by AmeriGlide is available in a medium-sized 60-gallon model, and facilitates wheelchair transfers with a unique profiled design and outward swinging door that gives you full access to the 22-inch high seat. 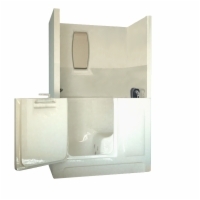 Users that are accustomed to doing self transfers with boards will find this walk in tub a breeze to get in and out of! 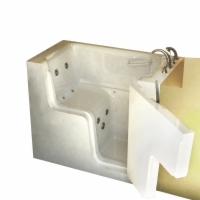 The Sanctuary Wheelchair Access walk in bath is made of fiberglass and triple-coated with a gel surface to prevent scratching and keep the water warm for longer periods of time!